America needs houses, but it also needs classic cars. 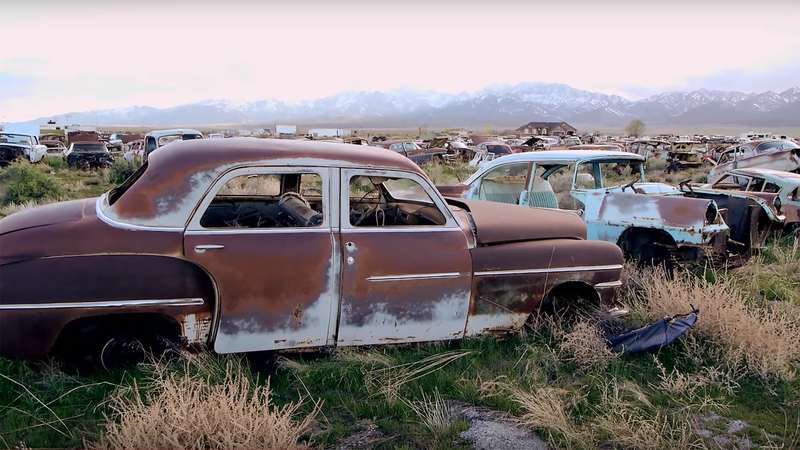 And those two impulses are coming to a head on the dusty plains of northern Utah, where suburban development is on the verge of snuffing out the state's last salvage yards for vintage vehicles—and with it, a 90-year-old family business and the hundreds of old cars it contains. 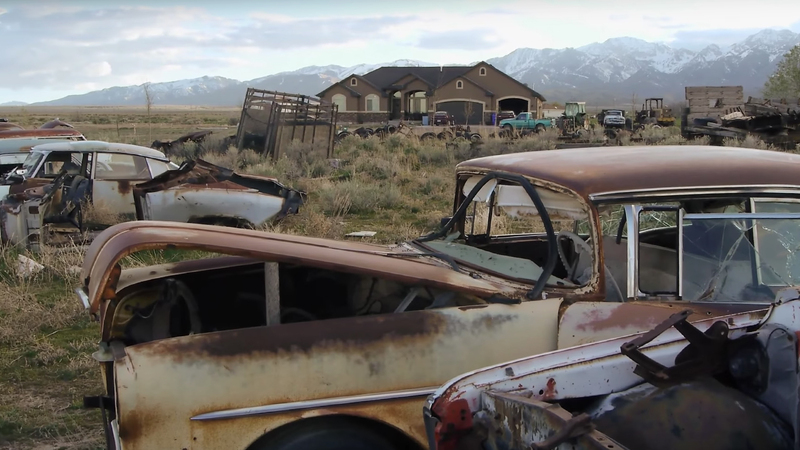 The plight of Dennis McBride's parts yard was first highlighted by local news station KSL-TV, who followed the 73-year-old around McBride's Auto Wrecking in the town of Grantsville as he explained why the expansive property was doomed. Of course, no words are needed; you can see identical McMansion-looking homes sprouting up above the acres of rusty metal in nearly every shot. "The regulations. My property taxes have quadrupled… and they want me to put a million dollar liability insurance to stay, just in case one of the new neighbor kids comes over and gets hurt… that’ll kill ya," McBride said in the report. With new local laws in place aimed at speeding up development and satisfying new homeowners, McBride now has to sell as many of the cars and parts as he can before June 15, at which point whatever's left will go to the crusher. 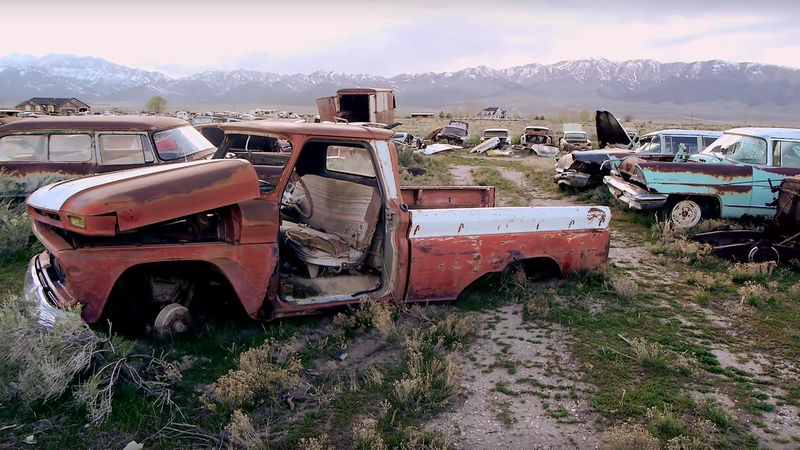 Thanks to high taxes and the threat of eminent domain, he'll also have to sell most of the land, which has been in his family since his father first opened the business on the grounds of the defunct Grantsville Airport in 1930 as one of the state's first auto wrecking yards. "I'm not too happy," he told the station, watching a construction worker apply vinyl siding to a new house on the other side of his fence. "They don't like the view of these old cars." Over the decades, McBride's father Aaron, a former Cord mechanic, accumulated hundreds and hundreds of cars spanning nearly every make and model from the 1940s to the 1970s through the wrecking business. Of course, the majority are in pretty rough shape—it is a salvage yard after all—but thanks to the dry Western air, many are good candidates for full restorations or valuable repositories for hard-to-find parts. He's got everything from obscure marques like Hudson, Packard, and Studebaker to acres of Fords, Chevys, and Dodges. Then there's the weird American ephemera, like a pinball machine that was allegedly once owned by Paul Tibbets, the pilot who flew the Enola Gay over Hiroshima when it dropped the atomic bomb in 1945. This YouTube tour gives a detailed look at the yard, and there's almost too much to take in. And then there's the impressive collection of pristine vintage cars he's assembled in the airport's old hangar, including a 1916 American LaFrance fire truck, a beautiful old Jaguar MK2, and an all-original 1956 Ford Thunderbird. Oh, and the old-school gas station on the property doubles as both McBride's office and a popular photo shoot site for local hot-rodders. The McBrides have always sold cars and parts to inquiring enthusiasts, but without a website or advertising, it's been a word-of-mouth operation. And with the clock now running out, Dennis realizing he won't be able to save all that automotive history as he sells almost everything off at scrap prices. 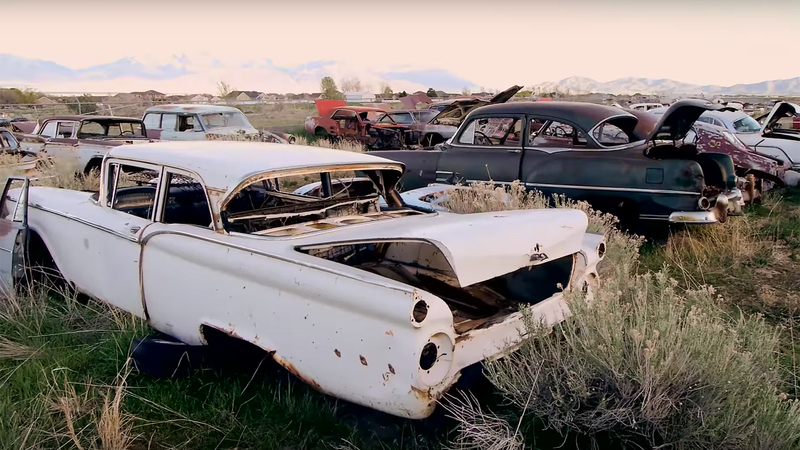 Hundreds of classic cars have already been crushed to free up space in the name of development. According to KSL-TV, McBride was able to convince the town to declare the hangar, gas station, and surrounding lot a historic property, and he'll save what he can by stuffing those spaces. But the acres and acres of old American iron are destined to fade into memory, and with them, one of the last vestiges of a bygone era. "Now there's not gonna be anybody with these old car parts. I miss those days," he said. "Way of the times, you know. Nothing you can do about it." Stuttgart fanboys, start rending your garments.